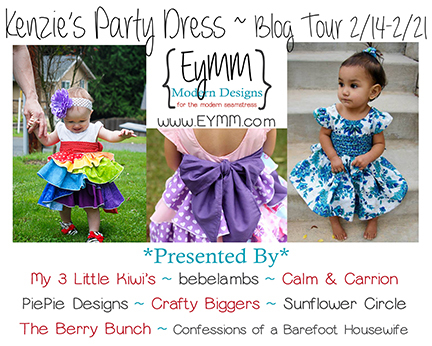 Kenzie’s Party Dress Blog Tour ~ My 3 Little Kiwi’s – Everything Your Mama Made & More! I have been looking forward to this blog tour so much! I am so excited to see what these talented ladies have created. Today is the first day of the tour and Lydia from My 3 Little Kiwi’s is the first stop on the tour! She did the simple skirt version of the dress for her daughter using a solid red satin. I must say it turned out stunning and the perfect start to the tour and for Valentines Day. So simple yet so elegant. Here are a few pictures but make sure to check out her blog for more pictures as well as details about the materials she used and what she thought about the pattern.